Osteoarthritis (OA) is the most common type of arthritis in the UK and one of the leading causes of disability. Symptomatic knee OA in people over 60 years affects 10-13% of the population. In one reported year, 25% of people over 55 years may demonstrate persistent episode of knee pain. The incidence of knee OA is likely to rise because of the increasing age of the general population and increasing rates of obesity. Increasing age, excess weight and trauma are common risk factors of knee OA. Other factors include activities that require repetitive kneeling/squatting, underlying genetic conditions and other health conditions, such as rheumatoid arthritis or gout. Abnormal knee alignment and appearance, with associated joint tenderness and joint swelling. Abnormal and painful gait; with associated restricted knee joint movement. Start-up pain; pain/stiffness when you have not moved your knee joint for a while. Crepitus – grating or crackling sound or sensation in your knee joint. Please note, not an indicator of further damage. A good physical examination should identify most of the signs and symptoms detailed above. Most people with knee OA will have a weight bearing knee x-ray at some point in their management. An x-ray report is normally graded as normal, mild, moderate or severe (severe knee OA – indicative bone on bone). 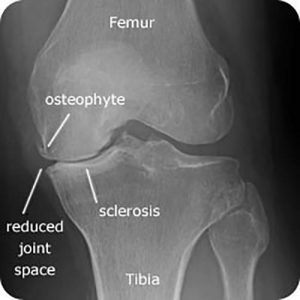 However, a proportion of radiographic knee OA sufferers report little or no pain. Radiographic knee OA is not an accurate guide to the likelihood that knee pain or disability will be present. Similarly, knee pain is not a good indicator for the severity of radiographic knee OA. As a result, further investigation by x-ray should not be used in isolation and an x-ray has to put into the clinical picture of what the person is experiencing. Management of knee OA is commonly in the form of physiotherapy and self-management, part of this including regular exercise. Other conservative options for knee OA may include acupuncture, steroid and hyaluronic acids injections. Steroid injections are sometimes indicated on acute knee OA flare ups. 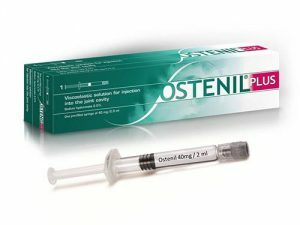 A hyaluronic acid injection is a synthetic joint lubricant with reported improvements for 9-12 months in mild to moderate knee joint OA studies (Figure 2). Surgical opinion for intervention is the last resort. The severity of your symptoms, level of disability, level of radiographic knee OA (or in some cases MRI), age, analgesia and medication, co-morbidities, your home and work status, will allow a surgeon to decide on your suitability for surgical intervention and/or Total Knee Replacement. Figure 1. Some of the radiographic features of knee OA. Figure 2. Hyaluronic acid injection to improve knee pain – available at ECP. I found this piece of writіng at thіs website.